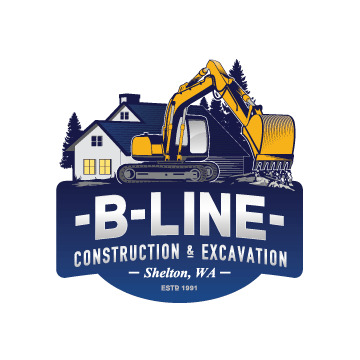 B-Line Construction was started by Don & Dana Woolliscroft 25 years ago back in 1991 right here in Shelton, WA in Mason County. This year we are very proud and excited to celebrate our company’s 25th anniversary. We proudly serve entire Mason County area including Shelton, Allyn, Belfair, Grapeview, Hoodsport, Lilliwaup, Allyn, and anywhere that resides in Mason County. We first started as a small excavation company and slowly began building the company to what it is today. We are now general contractors and specialize in excavation of all kinds, septic systems, new construction, and remodeling. We offer a wide range of services including septic system design, septic system installation, septic repair, septic pumping & inspection, land clearing, site clearing & preparation, road construction, custom home building, garage construction, large & small home construction projects, and remodeling of all kinds! Recent Projects: This past year of 2015 was one of our busiest years to date and kept us extremely busy. We designed & installed multiple septic systems, did many septic system repairs, completed multiple homes from the ground up including a beautiful 5,000+ sq. foot custom home, comp did many various small construction projects including new garages, decks, and stairs. Work we would like brought in: We would really like to focus on home & garage construction, and remodeling. In short we would like to emphasize on construction & excavation. We started out doing mostly excavation work and then began doing septic systems after which we started incorporating construction projects. Roughly five years ago we began doing large construction projects like custom homes & garages, and also remodeling. Some of our best traits: As a company being in business for 25 years we have many great traits and qualities that has allowed our company to be the success that it is today. Our greatest trait is that we always do quality work, have a great eye for detail, and we go above and beyond to ensure our customers are happy with our work. We strive to do the absolute best work we can so that our customers are glad to hire us again and recommend our company to their friends. In this business sometimes there can be unexpected problems, and this is another aspect of where our company outshines our competitors as we always do whatever it takes to remedy the situation. We have a saying here at B-Line, 'you are only as good as your last job' and that’s why no matter what we always do quality work from start to finish.